The full tableau included the previous three presidents and every major-party nominee for the past two decades. 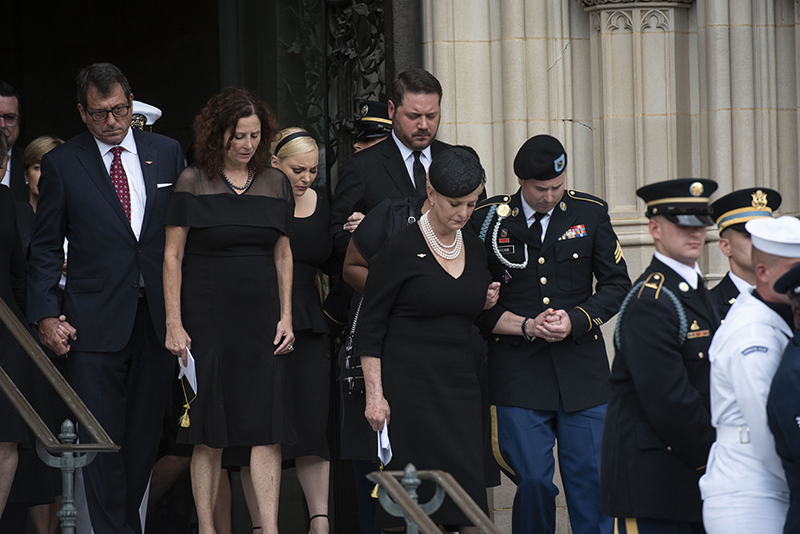 WASHINGTON — Official Washington gathered on Saturday for a funeral to honor one of its favorite sons, John Sidney McCain III. It delivered for the country and the world an extraordinary, and in moments disquieting, repudiation of Donald Trump’s presidency and today’s politics. The Republican senator’s mourners, though sometimes angry, were also wistful and worried that what has been bludgeoned by the country’s divisions and the current president might never return.A common decency. A shared identity and values that transcend ideology, class or race. A toughness that shows itself in battle and service to nation rather than on Twitter. Each of these was touted as a key element of McCain’s epic life. 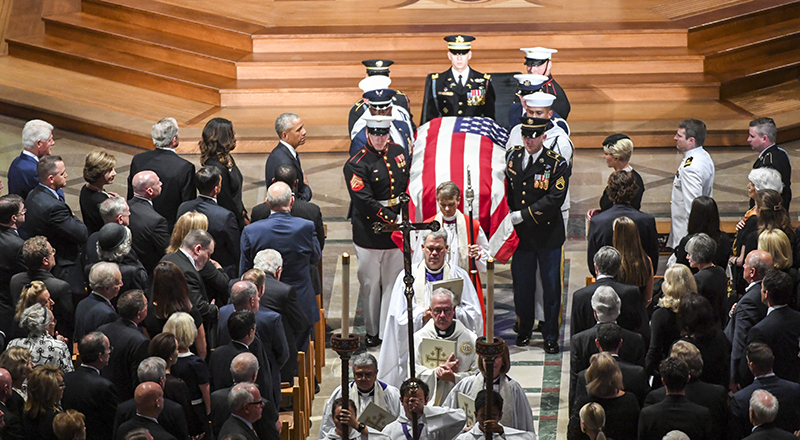 The full tableau of his funeral – which included the previous three presidents and every major-party nominee for the past two decades – also served as a melancholy last hurrah for the sort of global leadership that the nation once took for granted. Presidents Bill Clinton, George Bush and Barack Obama look on with the family as Sen. John McCain’s casket is taken out following the funeral service at the National Cathedral. The McCain family leaves the National Cathedral after the funeral of Sen. John McCain. Big Washington funerals are as much about the country and its politics as they are the person who is being remembered. On Saturday, speaker after speaker used McCain’s life story – son of an admiral, hero of a lost war, long-serving senator and statesman – and the values that shaped his life to point up the shortcomings of Trump and the divisive, angry politics of the moment. The funeral served as a robust and united defense of the Washington institutions that have been a cornerstone of American democracy and that Trump has sought to undermine. Sitting in the pews were the stewards of those institutions – the CIA, the Justice Department and the news media, among others – that Trump regularly attacks. Kissinger’s declaration seemed more like a wish from an old man than an affirmationof what would come to pass. As Kissinger was speaking, Trump, en route to the golf course, was tweeting a threat to terminate the North American Free Trade Agreement. On this Saturday morning, Hillary Clinton sat shoulder to shoulder with former vice president Richard Cheney, whom she routinely lambasted when she served with McCain in the Senate. Bush laughed with and playfully snuck candies to Michelle Obama. There as well, and listening impassively to the criticisms of the man they serve, were several members of Trump’s administration, including Chief of Staff John Kelly and Defense Secretary Jim Mattis – both former Marine Corps generals who share McCain’s ethic of selfless service. Also in attendance were Trump’s national security adviser, John Bolton, two of his most prominent ambassadors, and his daughter Ivanka Trump and son-in-law Jared Kushner. McCain also invited several of Trump’s possible Democratic challengers in 2020 – Former vice president Joe Biden, Sen. Elizabeth Warren, D-Mass., and others with whom he served in the Senate. Much of the praise for McCain focused on his vision of the United States as a global superpower and moral beacon, positions Trump has been accused of abandoning. His longtime friend, former senator Joseph Lieberman, lauded McCain’s globe-trotting ways and his advocacy on behalf of political prisoners and dissidents in far-flung places such as Myanmar and Syria. 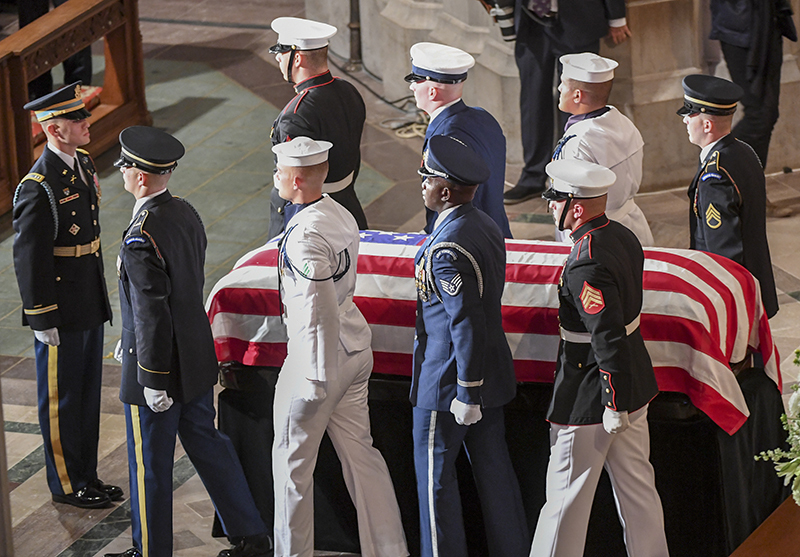 Sen. John McCain’s casket is carried during his service at the National Cathedral. The last time Washington held a funeral of this magnitude was in January 2007, when many of the same figures gathered to say goodbye to former president Gerald Ford.